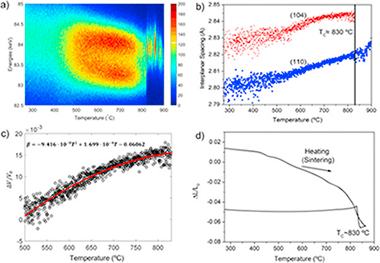 The potential of controlled rate thermal analysis (CRTA) for studying high-pressure gas-solid processes has been evaluated. CRTA is a type of smart temperature program based on a feedback system that uses any experimental signal related to the process evolution for commanding the temperature evolution. 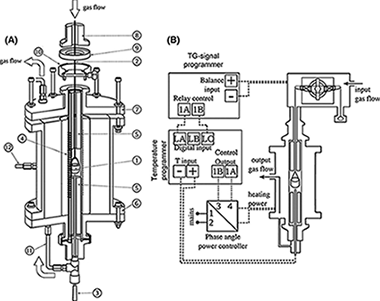 In this work, an instrument that uses the gravimetric signal for CRTA control has been designed and used for the study of two high-pressure gas-solid reactions: the highly exothermic thermal oxidation of TiC under high pressure of oxygen and the reduction in Fe2O3 under high pressure of hydrogen. Advantages of CRTA for discriminating overlapping processes and appraising kinetic reaction mechanisms are shown. The theoretical knowledge about the zinc-zinc bond has been recently expanded after the proposal of a zinc-zinc double bond in several [Zn-2(L)(4)] compounds (Angew. Chem. Int. Ed.2017, 56, 10151-10155). Prompted by these results, we have selected the [Zn-2(CO)(4)] species, isolobally related to ethylene, and theoretically investigated the possible (2)-Zn-2-coordination to several first-row transition metal fragments. 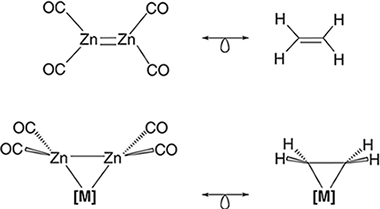 The [Zn-2(CO)(4)] coordination to the metal fragment produces an elongation of the dizinc bond and a concomitant pyramidalization of the [Zn(CO)(2)] unit. These structural parameters are indicative of -backdonation from the metal to the coordinated dizinc moiety, as occurred with ethylene ligand. A quantum theory of atoms in molecules study of the ZnZn bond shows a decrease of (BCP), delta(2)(BCP) (ZnZn) and delocalization indexes (Zn,Zn), relative to corresponding values in the parent [Zn-2(CO)(4)] molecule. The ZnZn and MZn bonds in these [((2)-Zn-2(CO)(4))M(L)(n)] complexes can be described as shared interactions with an important covalent component where the ZnZn bond is preserved, albeit weakened, upon coordination. In this study, electrochemical energy storage performances of an efficient Ni-Fe sulfide and hydroxide supported on porous nickel foam are compared. X-ray diffraction (XRD), X-rayphotoelectron spectroscopy (XPS) and energy-dispersive X-ray spectrometer (EDS) results confirmed the formation of Ni-Fe-S and Ni-Fe-OH electrodes. In addition, Brunauer-Emmett Teller (BET) was used to determine the specific surface area of the prepared materials. Moreover, the morphologies were observed by scanning electron microscopy (SEM). The brilliant characteristics of Ni-Fe-S could be attributed to transport acceleration in electrolyte ions and electrons, occurrence of redox reactions as well as the higher conductivity of the sample. From stand point of comparison, the capacitance of Ni-Fe-S is more than that of Ni-Fe-OH. 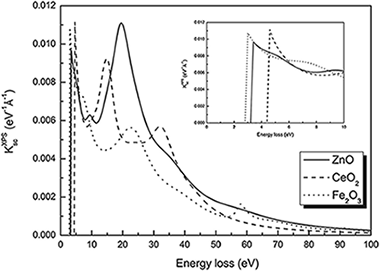 Therefore, the exchange of O2- with S2- in Ni-Fe-OH lattice obviously improves the electrochemical performance. The as-fabricated Ni-Fe sulfide electrode exhibits a tremendous specific capacitance of 884.9Fg(-1) at 1A g(-1). Furthermore, an assembled asymmetric supercapacitor device using the activated carbon as negative electrode and this smart configuration (Ni-Fe-S) as positive electrode also provided a maximum specific power and specific energy of 8000Wkg(-1), 37.9 Whkg(-1), respectively. Also, it shows cycling stability with 88.8% capacitance retention after 1700 cycles in aqueous electrolyte, demonstrating its potential application in the next-generation high-performance supercapacitors used for energy storage. El Gaidoumi, A.; Doña Rodríguez, J.M. ; Pulido Melián, E.; González-Díaz, O.M. ; Navío Santos, J.M. ; El Bali, B.; Kherbeche, A. We successfully synthesized an efficient photoactive pyrophyllite/TiO2 heterostructures using a sol-gel route at ambient temperature. The samples were prepared by exfoliation of a pyrophyllite layered-type clay by TiO2. The prepared samples exhibited strong photocatalytic activity for the degradation of phenol. 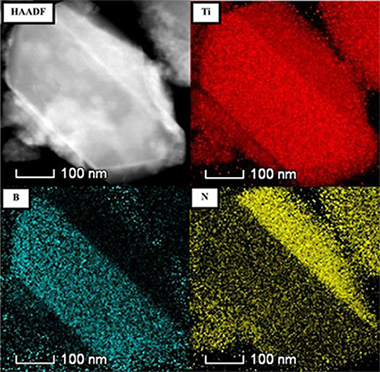 The heterostructure PTi750 (SBET = 16.58 m2/g) calcined at 750 °C, in which the mixed phases of anatase and rutile exist (52.2% anatase/10.7% rutile), showed the highest photocatalytic activity against commercial TiO2Aeroxide P25. The methanol washed PTi750 was 5 times faster than the corresponding unwashed sample; phenol was totally degraded with a TOC reduction of 89.2%. The materials have been characterized by: X-ray diffraction (XRD), Diffuse reflectance UV–vis spectrophotometry (UV–Vis DRS), scanning electron microscopy (SEM) and BET specific surface area. Pauly, N.; Yubero, F.; Espinós, J.P.; Tougaard, S.
Metal oxides are important for current development in nanotechnology. X‐ray photoelectron spectroscopy(XPS) is a widely used technique to study the oxidation states of metals, and a basic understanding of the photoexcitation process is important to obtain the full information from XPS. 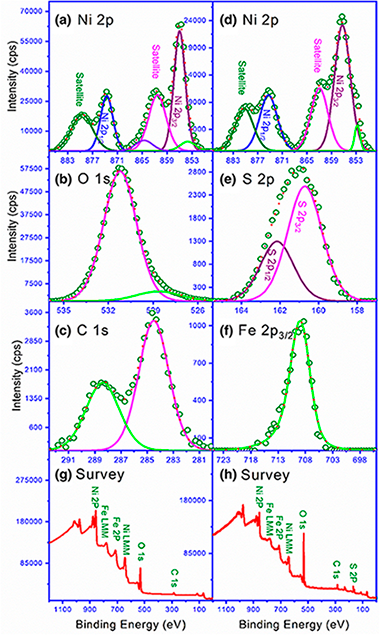 We have studied core level excitations of Zn 2p, Fe 2p, and Ce 3d photoelectron emissions from ZnO, α‐Fe2O3, and CeO2. Using an effective energy‐differential XPS inelastic‐scattering cross section evaluated within the semiclassical dielectric response model for XPS, we analysed the experimental spectra to determine the corresponding primary excitation spectra, ie, the initial excitation processes. We find that simple emission (Zn 2p) as well as complex multiplet photoemission spectra (Fe 2p and Ce 3d) can be quantitatively analysed with our procedure. Moreover, for α‐Fe2O3, it is possible to use the software package CTM4XAS (Charge Transfer Multiplet program for X‐ray Absorption Spectroscopy) to calculate its primary excitation spectrum within a quantum mechanical model, and it was found to be in good agreement with the spectrum determined by analysis of the experiment. Isolation of high-level radioactive waste (HLW) in deep geological repositories (DGR) through a multibarrier concept is the most accepted approach to ensure long-term safety. Clay minerals are one of the most promising materials to be used as engineered barriers. In particular, high charge micas, as components of the engineered barrier, show superselectivity for some radioactive isotopes and a large adsorption capacity, which is almost twice that of the other low charge aluminosilicates. In addition, high charge micas are optimum candidates for decontamination of nuclear waste through two different mechanisms; namely an ion exchange reaction and a nonreversible mechanism involving the formation of new stable crystalline phases under hydrothermal conditions. In this work, we report a new in situ optical sensor based on the incorporation of Eu3+ in these high charge micas for tracking the long-term physical-chemical behavior of HLW contaminants in DRG under mild hydrothermal conditions. The incorporation of Eu3+ into the interlayer space of the mica originates a well resolved green and red luminescence, from both the 5D1 and 5D0 excited states, respectively. The formation of new crystalline phases under hydrothermal conditions involves important changes in the Eu3+ emission spectra and lifetime. The most interesting features of Eu3+ luminescence to be used as an optical sensor are (1) the presence or absence of the Eu3+ green emission from the 5D1 excited state, (2) the energy shift of the 5D0 → 7F0 transition, (3) the crystal-field splitting of the 7F1 Eu3+ level, and (4) the observed luminescence lifetimes, which are directly related to the interaction mechanisms between the lanthanide ions and the silicate network. Lead halide perovskite nanocrystals have demonstrated their potential as active materials for optoelectronic applications over the past few years. Nevertheless, one issue that hampers their applicability has to do with the observation of photoluminescence intermittency, commonly referred to as "blinking", as in their inorganic counterparts. Such behavior, reported for structures well above the quantum confinement regime, has been discussed to be strongly related to the presence of charge carrier traps. In this work, we analyze the characteristics of this intermittency and explore the dependence on the surrounding atmosphere, showing evidence for the critical role played by the presence of oxygen. We discuss a possible mechanism in which a constant creation/annihilation of halide-related carrier traps takes place under light irradiation, with the dominant rate being determined by the atmosphere. High energy density, cycling stability, low cost and scalability are the main features required for thermochemical energy storage systems to achieve a feasible integration in Concentrating Solar Power plants (CSP). While no system has been found to fully satisfy all these requirements, the reversible CaO/CaCO3 carbonation reaction (CaL) is one of the most promising since CaO natural precursors are affordable and earth-abundant. 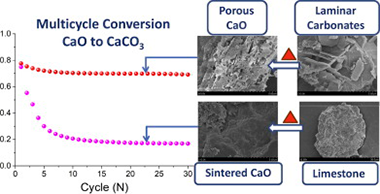 However, CaO particles progressively deactivate due to sintering-induced morphological changes during repeated carbonation and calcinations cycles. In this work, we have prepared acicular calcium and magnesium acetate precursors using a simple, cost-effective and easily scalable technique that requires just the natural minerals and acetic acid, thereby avoiding expensive reactants and environmentally unfriendly solvents. Upon thermal decomposition, these precursors yield a stable porous structure comprised of well dispersed MgO nanoparticles coating the CaO/CaCO3 grains that is resistant to pore-plugging and sintering while at the same time exhibits high long term effective conversion. Process simulations show that the employment of these materials could significantly improve the overall CSP-CaL efficiency at the industrial level. 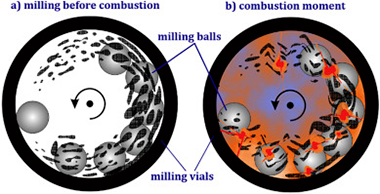 CaO-based materials have been identified as promising sorbents for highly efficient pre-combustion and post-combustion CO2 capture in fluidized beds operated at high temperatures by means of the Calcium Looping (CaL) process. However, Ca-based sorbents suffer from a decline of the capture capacity over multiple sorption/desorption cycles, mainly due to sintering, and from a markedly heterogeneous fluidization behavior due to the strength of interparticle attractive forces as compared to particle weight. The present study is focused on the development of novel synthetic CaO/Al2O3 sorbents for CO2capture with enhanced CaL performance and fluidizability by dry mixing with flow conditioner nanopowders. The influence of initial precursors on the sorbents multicycle activity at realistic CaL conditions has been investigated. The formation of a stable Ca9Al6O18 mixed-phase during the preparation of the sorbents promotes the multicycle capture capacity. The type of Ca and Al precursors, either soluble or insoluble, can significantly affect the dispersion of this stabilizer (Ca9Al6O18) in the sorbent matrix and, consequently, may affect the carbonation activity of the materials. The sorbent prepared from soluble aluminum nitrate and calcium nitrate precursors by sol-gel method exhibits a very stable multicycle capture capacity with a capture capacity around 0.2 g of CO2/g of sorbent after 21 cycles keeping a 72% of its initial capture capacity. The fluidizability of this promising sorbent was also investigated as affected by the addition of three different flow conditioners. Fluidization experiments confirmed the positive effect of using hydrophilic alumina and hydrophobic silica nanoparticles on improving the fluidizability of the synthesized sorbents. The study of the early stages of growth of ZnO on graphene supported on Cu and on highly oriented pyrolytic graphite by means of reactive thermal evaporation of metallic Zn at room temperature is presented. 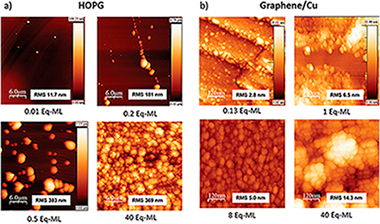 This growth method allows to go in depth in the study of the fundamental interaction between ZnO and graphene at the interface in quasi-equilibrium conditions. Quantitative, chemical, and morphological analysis is performed using photoemission spectroscopy, atomic force, and scanning microscopies as experimental characterization techniques and factor analysis and inelastic peak shape analysis as modeling techniques. 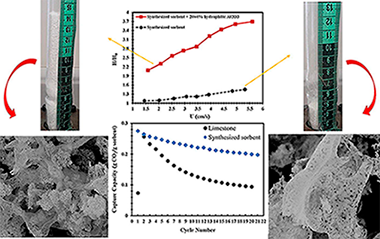 The growth of ZnO on a highly oriented pyrolytic graphite substrate is also studied using the same growth method for comparison. The results show that, in spite that the first atomic layer of both substrates is identical, the growth kinetics and morphology of the deposits are completely different. A model for the kinetics of the growth of ZnO on both substrates is proposed. Although thin film porosity is the basis of many optical sensors, it can be deleterious for a stable optical behavior of passive optical elements due to the condensation of water and other vapors in their pores. This paper proposes a new strategy for the magnetron sputtering (MS) fabrication of environmentally tight SiO2-TiO2 porous multilayers. 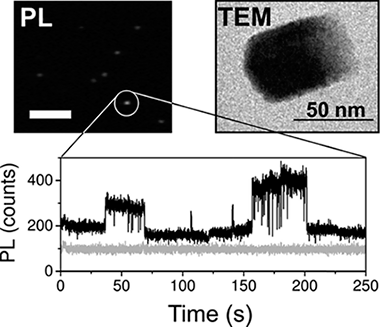 Thin films of these two oxides deposited in an oblique angle configuration (MS-OAD) present a nanocolumnar and highly porous nanostructure and, as a consequence, experience significant changes in their optical properties when exposed to water vapor. Similarly, the optical properties of Bragg reflectors and Bragg microcavities made of the stacking of porous and compact SiO2 and TiO2 thin films experience reversible changes when these 1D-photonic structures are exposed to water pressure. 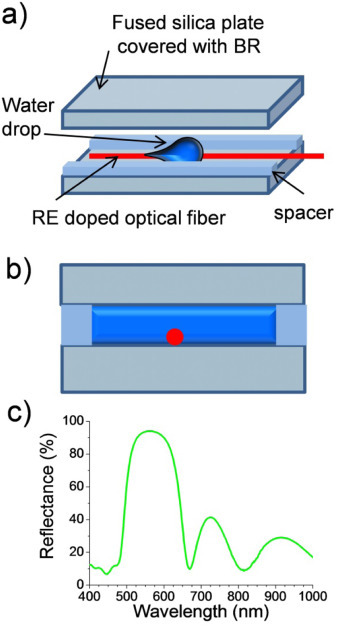 A key finding of this work is that a very thin capping layer of SiO2 deposited on the surface of porous SiO2 films in the stack, at the interlayer between the two oxides, efficiently seals the pores making the photonic structures environmentally tight. This capping layer approach is a useful strategy to incorporate porosity as an additional parameter to design the optical behavior of planar photonic structures while preserving optical and environmental stability. 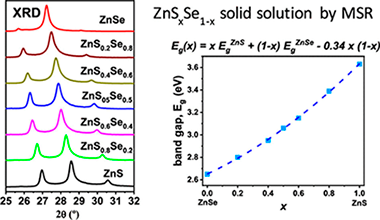 The complete ZnSxSe1-x solid solution was successfully obtained by the mechanochemical process denoted as a mechanically induced self-sustaining reaction. Excellent control of the chemical stoichiometry of the solid solution was possible by adjusting the atomic ratio of the starting Zn/S/Se elemental mixture subjected to milling. A mixture of both wurtzite-2H (hexagonal) and zinc blende (cubic) structures was always obtained, although for a similar milling time the proportion of the zinc blende structure increased with the Se content in the solid solution. However, wurtzite was the major phase for S-rich compositions when milling was stopped just after ignition. It was demonstrated that milling induces the wurtzite-to-zinc blende phase transition. The 8H hexagonal polytype was also observed in samples subjected to long milling times. Variation of the lattice parameters for both structures with the x value in the solid solution presented an excellent linearity, confirming the validity of Vegard's law. However, variation of the band-gap energy (E-g) with x was not perfectly linear, and a small bowing parameter of 0.34 was obtained. It was possible to tune the E-g value between those of the end members of the solid solution in a continuous manner by adjusting the stoichiometry of the solid solution. The morphology and crystalline domain size can also be controlled by adjusting, in this case, the postignition milling time of the mechanochemical process. Chenchana, A.; Nemamcha, A.; Moumeni, H.; Doña Rodríguez, J.M. ; Araña, J.; Navío, J.A. 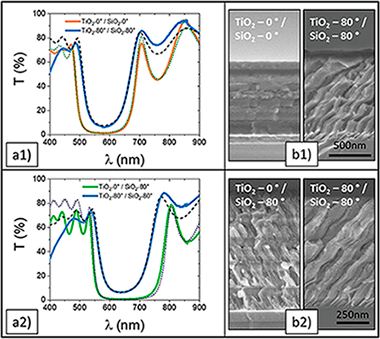 ; González Díaz, O.; Pulido Melián, E.
In this work, novel TiO2-based nanobelts with various phases were synthesized: biphasic TiO2(B)/anatase, pure TiO2(B) and pure anatase. 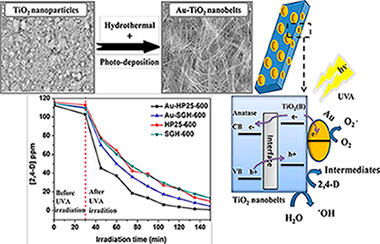 These catalysts were obtained via hydrothermal reaction using two nanoparticulated TiO2 photocatalysts as precursors: Aeroxide TiO2 P25 (P25) and TiO2 synthesized via a sol-gel process (SG). In addition, the surface of the photocatalysts was modified with gold using a photodeposition method. A characterization study of the different photocatalysts was performed with X-ray diffraction analysis (XRD), UV–Vis diffuse reflectance spectra (DRS), scanning electron microscopy (SEM), X-ray photoelectron spectrum analysis (XPS) and Brunauer-Emmett-Teller measurements (BET). The photocatalytic reaction of the herbicide 2,4-dichlorophenoxyacetic acid (2,4-D) was investigated under UVA irradiation. A toxicity analysis was performed with the marine bioluminescent bacteria Vibrio fischeri. The highest 2,4-D removal efficiency of 99.2% was obtained with the biphasic Au-TiO2(TiO2(B)/anatase) nanobelts with anatase as predominant phase. Toxicity was mainly due to the intermediate 2,4-dichlorophenol (2,4-DCP) which was eliminated in 4 h. The TiO2 nanobelt phase structure is shown to have a significant effect on photocatalytic activity. Murcia, J.J.; Cely, A.C.; Rojas, H.A. ; Hidalgo, M.C. ; Navío, J.A. In this study, commercial and lab-prepared TiO2 were modified by fluorination and platinum photodeposition; and the effect of these modifications over the physicochemical and photocatalytic properties of TiO2 was evaluated. It was found that F and Pt addition leads to the modification of the optical and textural properties of TiO2. The materials prepared were tested in the photocatalytic degradation of different organic dyestuffs such as methylene blue (MB) and methyl orange (MO); the degradation of commercial anilines employed in the staining of natural fibers was also evaluated. Photocatalysis was also studied in this work as an eco-friendly treatment of wastewater coming from handicrafts factories. In general it was observed that the effectiveness of the photocatalytic treatment strongly depends on the substrate to be degraded, thus, fluorinated and platinized commercial Titania (Pt-F-P25) showed the best photocatalytic performance in the MB and MO photodegradation and in contrast, in the case of the anilines the highest degradation was obtained over commercial TiO2 fluorinated (F-P25). These results can be explained by differences observed in the structure and in the adsorption of these dyestuffs over the photocatalysts surfaces. F-P25 photocatalyst also demonstrated to be the best material for the treatment of real wastewater coming from handicrafts factories. 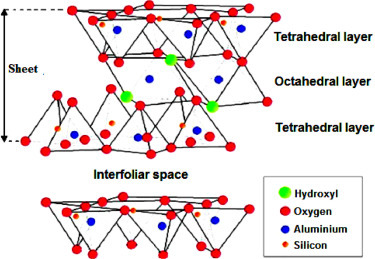 In this work, a titanium boron carbonitride advanced ceramic was successfully synthesised by a solid-gas mechanochemical reaction in a planetary ball mill from a mixture of elemental Ti, B, and C under nitrogen atmosphere. This material, with a general formula of Ti(BCN), exhibits a face-centred cubic structure (NaCl type) that is analogous to Ti(CN). This phase was gradually formed with sufficient milling time as a result of diffusional processes, which were permitted by the reduction of the energy in the system caused by the decrease in the spinning rate of the planetary ball mill. In contrast, under more energetic milling conditions, a mechanically induced self-sustaining reaction (MSR) took place, leading to the formation of a TiB2-Ti(CN) ceramic composite. The microstructural characterisation revealed that Ti(BCN) was composed of ceramic particles constituted of misoriented nanocrystalline domains. B, C and N were optimally distributed in the Ti(BCN) phase. The TiB2-Ti (CN) ceramic composite was composed of micrometric and nanometric particles homogeneously distributed. Additionally, the nitrogen content obtained for Ti(BCN) was higher than for the Ti(CN) phase in the composite material. The sintering mechanism of BiFeO3 has been investigated in-situ by energy dispersive X-ray diffraction (ED-XRD) using a high-energy white collimated X-ray beam from the Advanced Photon Source (Argonne National Laboratories). Such radiation is very penetrating thereby allowing measurements of the sample even when placed inside the flash sintering set up. Additionally, the fast ED-XRD measurements permit monitoring the flash sintering process by providing information about phase composition and sample temperature in real time. Moreover, profile scans, obtained by moving the stage vertically while recording the ED-XRD spectra, permit investigating the homogeneity of the flash for the entire length of the sample. All experiments have been complemented by ex-situ studies. It has been concluded that flash sintering of BiFeO3 is a homogeneous process without any directionality effects. Furthermore, flash sintering takes place at quite low temperatures (below the Tc ≈ 830 °C), which may be related to the high quality of the samples, as pure, highly insulating ceramics without evidence of secondary phases with a homogenous nanostructured grain size distribution are obtained by this technique. Moreover, it is also evidenced that the rapid heating of the sample does not seem to justify, at least by itself, the densification process. Therefore, it appears that the electric current should play a role in the enhanced mobility during the sintering process. In this study, the treatment of wastewater coming from a river highly polluted with domestic and industrial effluents was evaluated. For this purpose, series of photocatalysts obtained by ZnO and TiO2 modification were evaluated. The effect of metal addition and Ti precursor (in the case of the titania series) over the physicochemical and photocatalytic properties of the materials obtained was also analyzed. The evaluation of the photocatalytic activity showed that semiconductor modification and precursor used in the materials synthesis are important factors influencing the physicochemical and therefore the photocatalytic properties of the materials obtained. The water samples analyzed in the present work were taken from a highly polluted river, and it was found that the effectiveness of the photocatalytic treatment increases when the reaction time increases and for both, wastewater samples and isolated Escherichia coli strain follow the next order Pt/TiO2 << ZnO. It was also observed that biochemical and chemical demand oxygen and turbidity significantly decrease after treatment, thus indicating that photocatalysis is a non-selective technology, which can lead to recover wastewater containing different pollutants. An optical temperature sensor suitable for label free liquid sensing has been designed and characterized. The sensor combines the photochemical stability of rare earth doped glasses and the high sensitivity of interferometric resonators. It is formed by a planar Eabry-Perot (FP) microcavity filled with the liquid to be monitored. A Ho3+ doped tapered optical fiber has been placed inside the microcavity surrounded by the fluid medium. An external laser is focused on the optical fiber inside the cavity to induce the luminescence of the Ho3+ ions, which couples to the FP optical resonances. The spectral position of the FP resonances is highly sensitive to the refractive index of the cavity medium. A second laser is co-aligned with the first one to locally heat the liquid medium around the optical fiber. An average blue shift of the FP resonances around 32 pm/degrees C is measured. The limit of detection of the laser induced heating of the liquid medium is about 0.3 degrees C in the biological temperature range. Alternatively, a hot-plate is used to heat the system. Interestingly, a red shift of the FP modes is observed with 75 pm/degrees C dependence and 0.12 degrees C limit of detection features. The influence of one dimensional substrate patterns on the nanocolumnar growth of thin films deposited by magnetron sputtering at oblique angles is theoretically and experimentally studied. 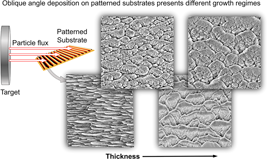 A well-established growth model has been used to study the interplay between the substrate topography and the thin film morphology. A critical thickness has been defined, below which the columnar growth is modulated by the substrate topography, while for thicknesses above, the impact of substrate features is progressively lost in two stages; first columns grown on taller features take over neighboring ones, and later the film morphology evolves independently of substrate features. These results have been experimentally tested by analyzing the nanocolumnar growth of SiO2 thin films on ion-induced patterned substrates. 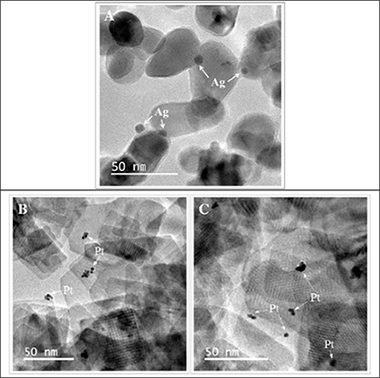 The nanoparticles of vanadium, niobium, and tantalum carbides were synthesized by a mechanically induced magnesiothermic combustion in the separate Mg/V2O5/C, Mg/Nb2O5/C, and Mg/Ta2O5/C systems. Initial materials in these systems ignited after short milling times of 10, 10, and 23 min, respectively. X-ray diffraction (XRD), X-ray photoelectron spectroscopy (XPS), energy-dispersive X-ray spectroscopy (EDS), high-resolution transmission electron microscopy (HRTEM) and elemental mapping techniques were employed to characterize the combustion products. In this process, magnesium reduces initial oxides to generate elemental V/Nb/Ta to react with carbon, forming the carbide phases.